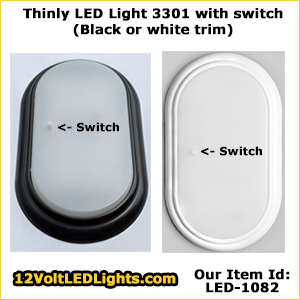 The "Thin" 12 Volt LED Dome Light 3301sL with Switch is a Surface Mount fixture with an Extremely Low Profile of only 0.7" (PLUS the switch) - for comparison, a dime is 0.705" in diameter. This oval shaped plastic light fixture has a nicely rounded contour. The soft white lens features a compact through-lens switch. 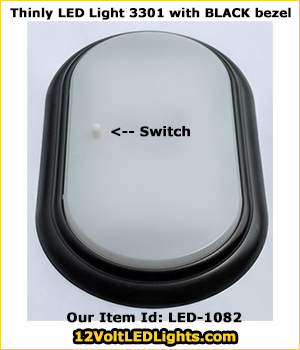 This minimizes the overall height of the fixture except for the switch, enhancing the low profile benefit, especially important if you have a low ceiling and need a surface mount fixture. This LED ceiling light offers a bright light output for such a thin profile, making it a welcomed product for rv interior lighting or boat interior lighting. This Thin LED Dome Light output is 650 lumens and compares to a 75 watt incandescent bulb. The soft white lens produces an amazingly even light pattern without glare or shadow. Dimmable with a PWM (pulse width modulated) 12 Volt dimmer, such as the EF1206 Dimmer. Interior RV lighting / boat lighting designed for use on 12 volt or 24 volt DC systems (acceptable voltage range is 10 vdc minimum / 30vdc maximum). They shipped quickly. They were easy to install and really brighten up our camper. Mounted in the Habitat For Humanity Restore Truck on Sunday. Nice and bright. Added a 60 min timer to it so the truck battery does not go dead. FriLight 87072 Spot Gyro LED Dome Light with rocker SWITCH, 12 volt - 24 Volt (10-30vdc). Recess Mount. Multiple LED bulb choices. Not for Sale. Free Shipping - order today! FriLight 8675 (no switch) Pinto LED Ceiling Spot Light, 12 volt-24 Volt (10-30vdc). Recess Mount. Choose soft Warm White 3 Way LED, bright Cool White LED, soft Warm White LED, Red, Blue, or Bi-Color LED.